An expert in organic skincare, Hairborist combines the power of nature, the spirit of well-being and innovative skincare technology. 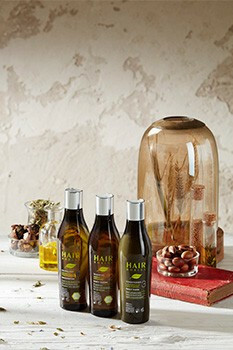 Natural cosmetic extracts coupled with aromatherapy and essential oils provide strength and shine to your hair, while giving it a unique sensory experience. We are experts in organic skincare… Hairborist has been mastering the art and science of hair and beauty by studying different plant compositions and essential oils with the utmost precision. Hairborist manufactures all its products in Belgium and thus masters the entire process of developing naturally-inspired healthy skin care and beauty formulas. Manufacturing its products in Belgium, they guarantee good working conditions for its employees and create jobs locally. Sources its packaging exclusively from Europe. Encourages consumers to reduce their environmental impact by offering discounts to anyone who refills empty bottles. Prohibiting the use of polluted and harmful petrochemical ingredients in its formulas such as silicones, parabens, mineral oils. The formulas are clinically tested on all skin and hair types, including dry, oily and sensitive. Certified under the ecogarantie label, one of the most requested eco-labels in Belgium, our products do not contain any parabens, silicones or mineral oils. The products contain no artificial colours or fragrances, we create them ourselves using natural organic ingredients and essential oils.